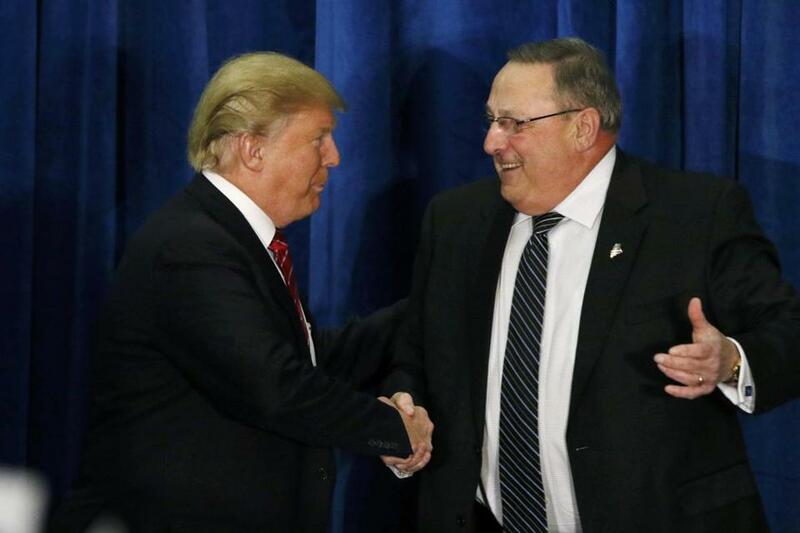 Republican presidential candidate Donald Trump shook hands with Maine Governor Paul LePage after LePage introduced him at a campaign rally in Portland, Maine. One hundred years ago, Maine was known as the nation’s political bellwether. But in the 2016 presidential race, the state is merely expected to follow New England’s lead in the state’s weekend caucuses. At best, this weekend’s Maine caucuses are a chance for candidates not named Hillary Clinton or Donald Trump to sneak in a win. But as campaigns scramble to put together a Maine operation in the days following Super Tuesday, they are working in a black hole. There’s been no polling, and the caucus format is unpredictable. Sixteen states have already had nominating contests — many of which boasted record high voter turnout. Several states are holding caucuses or primaries this weekend, including Louisiana, Kansas, Nebraska and Puerto Rico. But those on the ground in Maine said they are missing out on the big show. To be sure, some candidates are visiting Maine this week: US Senator Bernie Sanders made his second appearance in Portland Wednesday, and Trump made his second stop in the state Thursday en route to the GOP debate in Michigan. On Friday, US Senator Ted Cruz will visit Orono, a town less than 100 miles from Canada. But other than this, few candidates have made the trek to Maine. Former US secretary of state Clinton visited Portland in September. Ohio Governor John Kasich visited in March, before he was an official presidential candidate. Otherwise, campaign surrogates have made the trip: Actress Susan Sarandon campaigned last week for Sanders, and Olympic figure skater Michelle Kwan campaigned Tuesday for Clinton. The attention Maine receives this week is a fraction of what was showered on its neighbor, New Hampshire. But Maine’s political activity is also minimal compared to Massachusetts, which had visits from both Democratic candidates less than 24 hours before Tuesday’s polls opened. Maine state Representative Joel Stetkis, a Canaan resident leading the effort for Cruz in the state, described their operation as “volunteers taking it up amongst ourselves” until this week. The campaign has since kicked into full gear. Last Friday, Maine Governor Paul LePage endorsed Trump (LePage originally backed New Jersey Governor Chris Christie before he dropped out). But the governor has only informally mobilized his political apparatus to help Trump because there was so little time to organize. That said, many Maine political strategists view a Trump win in the state as inevitable given his momentum coming out of Super Tuesday and the LePage endorsement. Bates College political science professor John Baughman agrees, saying Sanders must win Maine. “Not because it wins him a lot of delegates, but because it’s just the kind of state he ought to win — northern New England, disproportionately white,” Baughman said. Maine’s political parties — not the state — run this weekend’s caucuses, which means thee process might play out a bit differently. Unlike Iowa or several other state caucuses, the Maine caucuses are on different days: Republicans on Saturday and Democrats on Sunday. Republicans have 22 caucus locations around the state, while Democrats will have well over 400. What’s more, absentee ballots are allowed in the caucuses. More than 20,000 of them were submitted by Wednesday’s deadline to the Maine Democratic Party, according to its executive director. Party leadership has said they see this as an omen for high turnout on Sunday. The Republicans have allowed ballots for active military, disabled veterans, and national guard members. But as much as Maine’s caucuses are unique, locals are not sure the results will be this weekend — at least compared to the rest of New England. Much like neighboring New Hampshire, they expect voters to go with candidates they see at outsiders: Trump and Sanders. In other words: As the nation goes, so goes Maine. James Pindell can be reached at james.pindell@globe.com. Follow him on Twitter @jamespindell or subscribe to his daily e-mail update on the 2016 campaign at www.bostonglobe.com/groundgame.